Spring - Summer season is all about juicy and vibrant fruits. Its season of strawberries. How about a fruit shake recipe with strawberry without sugar?? Great! !...Here it is...This strawberry and dates milkshake with apple chunks has become one of my favorite summer treats. And the great thing is , this shake recipes is perfectly sweetened with dates and so this is the best sugar free milkshake ever. 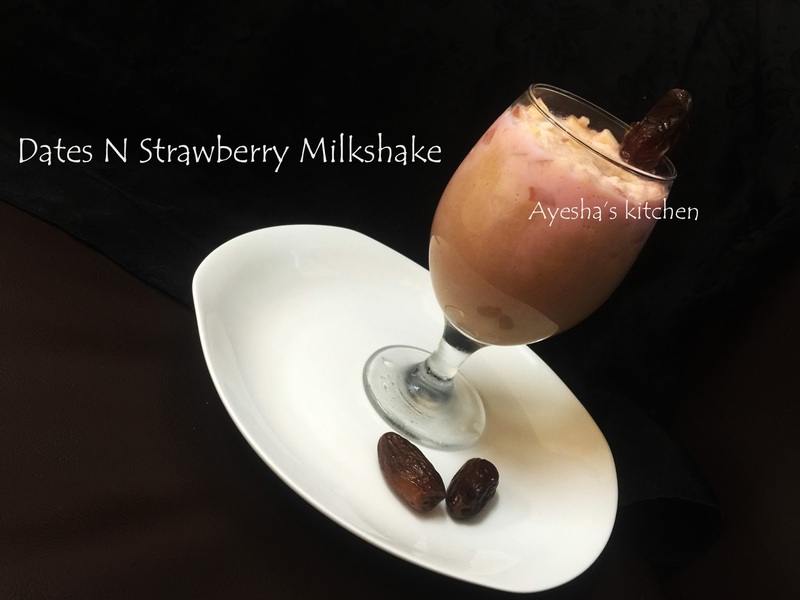 Dates are considered to be one of the best all natural sweeteners A rich milkshake with strawberry and the evergreen favorite dates is good enough for a healthy drink. Do you know the health benefits of dates? Its nutritious value is much above any other fruits. This easy milkshake recipe is equally loved by both kids and adults. A perfect drink for kids back from school and for every one during this hot summer. Its a very rich smoothie recipe for small parties and the way of presentation will surely attracts every one. Will see how the two layers formed ...Here is the recipe showing how to make perfect welcome drink milkshake / how to make milkshake with strawberry and dates / best healthy summer treats / Milk shake recipe / strawberry milk shake recipe / healthy sugar free juice drinks ..
Chop the apple finely and set aside. Blend the chopped strawberry and half a cup of chilled milk well in a blender at high speed until smooth. Set aside. Now blend dates and 1 cup of chilled milk in a blender until smooth. Set aside. Now the assembling. Take two serving cups ready. Add few tsp of apple chunks to it. Now pour the strawberry shake up to quarter level of the serving cup. And then pour the dates shake to the center of the cup. Just give a gentle stir while drinking. 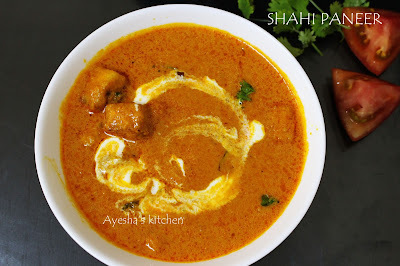 Shahi paneer is a rich Indian curry in a thick gravy of cashews, curd and other spices. Shahi paneer is one of the most popular paneer recipes. With its delicate milky flavor, Paneer / cchena can be used in curries and can even for desserts like Rasmalai, Rasgulla recipes etc. It is known as a royal dish for paneer lovers and as in the name the term Shahi means royal. A delicious North Indian curry with Cottage cheese / paneer. Shahi paneer recipe is a preparation of paneer in a thick gravy made of cream, tomato, cashew paste and spices. It tastes yumm when served along with roti, nan, rice, poori. 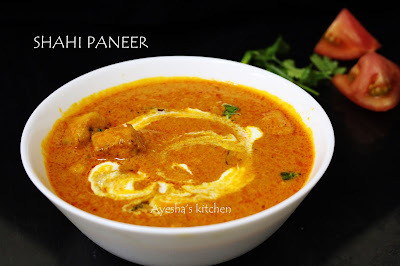 Some of other similar mughlai dishes are kadai paneer, paneer makhani /paneer butter masala, paneer do pyaza, shahi paneer korma, chilli paneer, paneer tikka masala and so on..Here in this recipe you can use butter instead of oil for sauteing. And i have added pureed onion to make this gravy more thick. 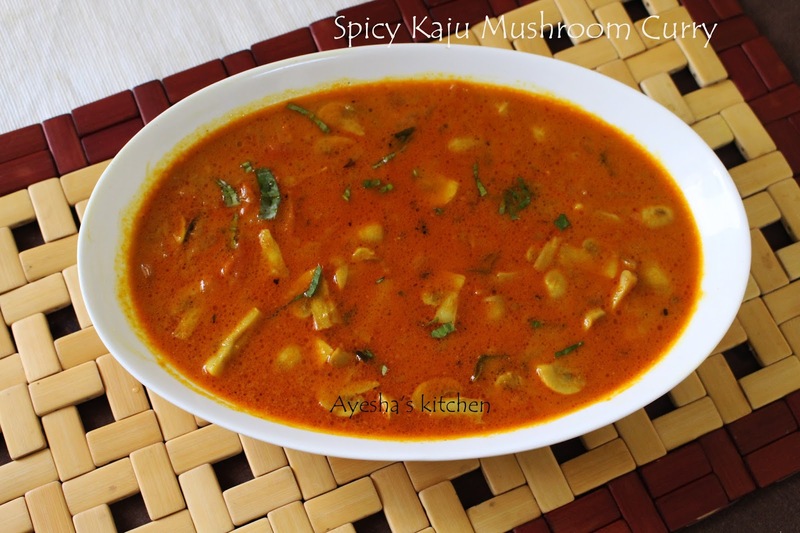 Try this creamy , aromatic, rich gravy and have a delightful dinner meal. Here is the recipe showing how to make shahi paneer curry / How to cook shahi paneer /gravy / vegetarian side dishes gravy / healthy side dishes / easy vegetable side dishes. Slice the home made Paneer into cubes or if you are using store bought, then soak it in salt water for few minutes to make them soft. Now heat oil in a wok and once hot shallow fry the paneer until they turn slightly brown. Remove from pan and drain the excess oil using tissue paper. Set aside. Then splutter cumin seeds in the same oil . Add the onion paste ( pureed onion using a blender). Saute till the water in the onion gets evaporated and the raw smell goes off. When done add the ginger garlic fennel seed paste, asafoetida and saute well until the raw smell disappears. Now add the tomato puree to it . Let it cook until the oil separates. When done, add the spice powders one by one along with some salt. Give a fine mix. When the gravy thickens and reduced to half its volume, add curd, fresh cream and cashew paste ( combine them together in a bowl first and then add) mixture to it. Mix well. Add half a cup of water along with it and let it boil. Finally add the tossed paneer to it and reduce the flame to low. Let it cook well for 5 minutes with lid closed until the gravy is slightly thick in consistency. Remove from heat. Shahi paneer tastes best when served hot. 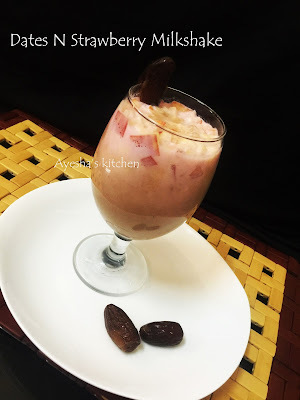 How about a healthy quick recipe with dates and nuts????.. Here it is. 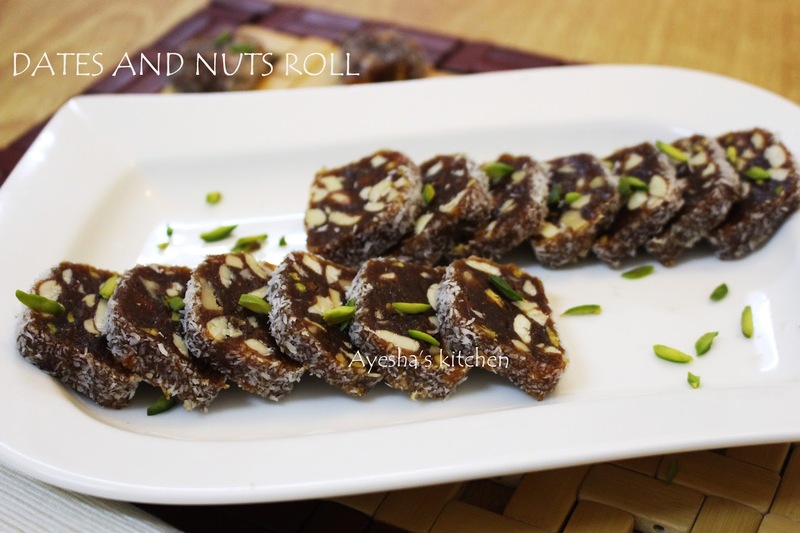 A healthy sugar-free sweet with dates, nuts and desiccated coconut. It's a very quick and finger licking sweet prepared just in minutes. It is a very helpful and no-fail sweet recipe for beginners. Sure, you all will notice this sweet in a bakery by various other names like Khajur pak, khajur katri, dates roll, dates burfi, khajur roll with poppy seed and so on. On the other hand, the NUTRITIOUS BENEFITS. Date have the impressive list of nutrients, vitamins and minerals which benefits health and overall well being. 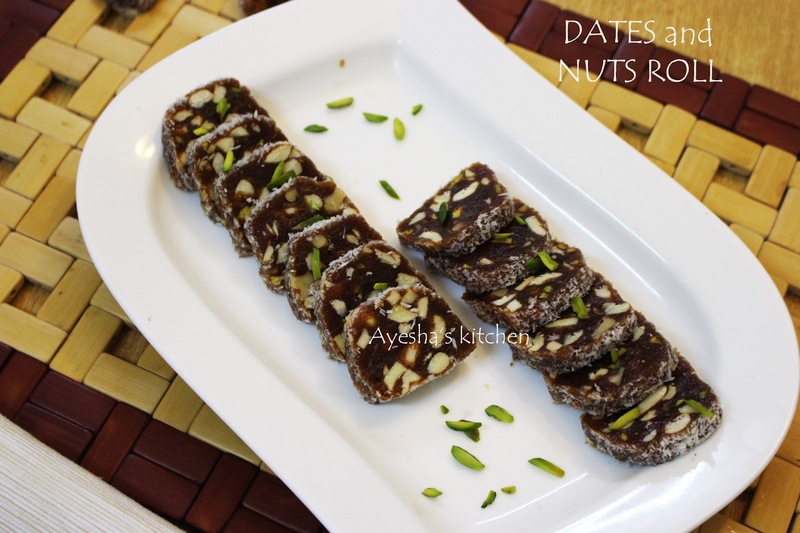 the dates are one of the very best sweet and versatile foods. And you know one thing..it can boost energy levels in people within half an hour of consuming it. It is also said that eating one date per day is very good for eye health all your life. Dates are a good source of vitamins and minerals. It is also the good source of energy, sugar and fiber. Homemade Dates roll is as good as store bought sweet. It is super easy and tastes heavenly with the crunchiness of nuts in each bite. It is the best sweet that can be tried for parties or functions which will surely attract the guests and will get loads of appreciation. As its sugar-free, those on diet can also much them without any worries. Do try this and enjoy this healthy nutty sweet. Here is the recipe for how to make quick sweet with dates / how to dates roll / how to make khajoor burfi. Remove the seed from dates and grind the dates without adding a drop of water. Make a paste. It will be sticky. Don't get panic. Heat a pan and dry roast the mixed nuts for 2 minutes and set aside. Now add butter to the same pan and add the ground dates, stirring continuously. Cook for 3 minutes on a medium flame. Now the dates will be non-sticky and then add the chopped roasted nuts. Combine very well and remove from flame. Let it cool for 10 minutes on a plate at room temperature. Now take the desiccated coconut on a plate and roll the prepared dates roll in it. Wrap it in a cling film/foil and then chill it for 1 or 2 hours. ( you can also roll in with poppy seed or powdered almonds or powdered pistachios). Do not keep it for more than two hours as it will be very hard to slice. When done, take out and remove the cling film and then slice it with a sharp knife and serve. Also please check my kunafa recipe made with kunafe dough. We moms feel happy when kids are happy with their lunch box meal. Kids love attractive and colorful meals. Here is a quick flavorful and healthy rice recipe for kids lunch box. 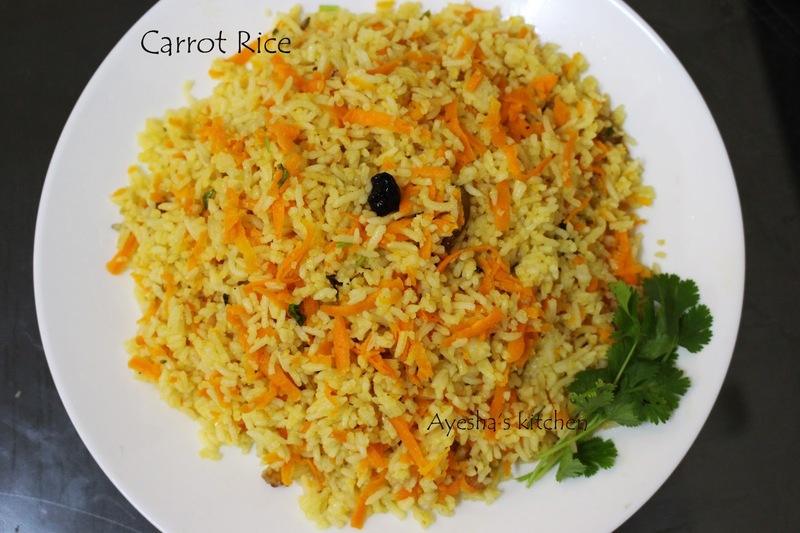 Carrot rice is a wholesome one pot meal to pack in lunch box for both adults and kids which is both tasty and healthy. More over it is the best rice recipe for our busy days and can make it for lunch or dinner. 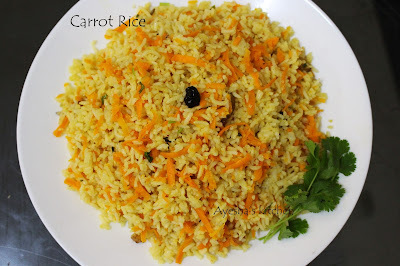 Here is the recipe showing how to make carrot rice / easy lunch box recipes. Wash and soak rice for few minutes and then drain it. Boil 2 cups of water with salt and when done add the rice to it. You can add few drops of oil to the boiled water to prevent the stickiness of rice. Cook until 95 % done and drain the water. Spread the rice in a wide opened bowl by adding few tsp of ghee or unsalted butter. This also helps to get rid of sticky rice. It is best to prepare such rice dishes with left over cooked rice. 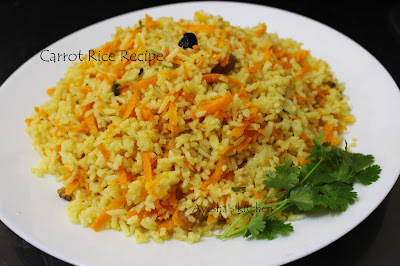 I always take more amount of rice whenever i prepare ghee rice and keep the leftover cooked rice in fridge for my kids and hubbys tiffin meals like carrot rice, fried rice, capsicum rice, lemon rice, mushroom rice, pulav and so on. Now heat a nonstick wok with some oil and when hot splutter cumin seed. Then saute onion until transparent and then add green chilly, ginger garlic paste and cook until the raw smell goes off. Then add garam masala powder along with some salt. Now add grated carrot and stir on a high flame for a minute. Then simmer the flame and add pepper powder , lemon juice and give a fine mix. Now heat a pan with some butter / ghee and toss the cooked rice for few minutes. When done add the rice to the sauteed mixture and gently mix well. Serve hot with raita or pickle. Delicious healthy carrot rice ready. Do you feel much irritated in chopping onions for a yummy curry when you are very busy or tired??? ?....If so here is the lip smacking spicy curry without onion. A spicy tangy chemmeen curry. Kerala, (the coastal south Indian state) is very much popular for its seafood delicacies. As the dish with Shrimps / Prawns / konju is my favorite seafood delicacy i often prepare many varieties with prawns / konju. 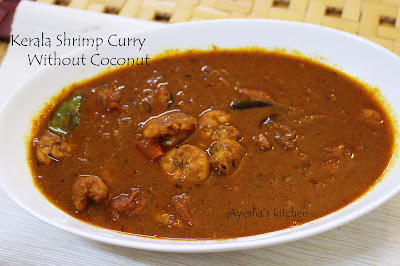 Kerala style prawn curry / Chemmeen mulaku curry is my all time favorite recipe. More over, its Malabar special chemmeen curry only. I love to prepare this dish as it is very quick, really tasty, spicy and easy recipe with very handy ingredients. I am a big fan of red curries. But i couldn't bear the hotness of such reddish colored curries like red hot fish curry, toddy shop curry, spicy hot chicken curry and all. And so one of my friend taught me how to make red hot curry with mild hotness and reddish color. Its nothing but heat oil and just make the flame very very low. Add the spice powders like chili powder, coriander powder and turmeric powder to that hot oil along with some salt. Saute continuously for few minutes until it turns to a fine texture. CAREFUL..Do not make the flame high as it will burn the spices and will taste worse....And now add the prawns or chicken and saute for few minutes until prawns or chicken are well coated with the spices and then set aside..And then followed by other steps... So lets see how to make Kerala style prawns red curry with mild hot ....Hope you all will love this recipe... Its a must try recipe....Sure you will crave this more. Heat oil in a wok and when hot, splutter cumin seed and then saute the sliced tomatoes and green chilies until mushy. Transfer it to a plate. Now set aside all the spice powders ready and then again heat oil in the same wok. When hot, reduce the flame to medium low and add chili powder, turmeric powder, coriander powder along with salt. Saute these spices well in the oil for few minutes and when the texture looks fine, add the cleaned prawns to it. Now saute for few minutes, add the sauteed tomato chili gravy to this along with salt. Mix well, let it cook for 2 minutes. Meanwhile, crush the soaked tamarind with hand and add the tamarind juice to it. Do not add more water. REMEMBER...For the BEST and PERFECT curry, the gravy should not go above the level of the fish. Cook until the oil separates. Heat oil in a pan and fry chopped shallots and curry leaves. Pour it over the curry for tempering. 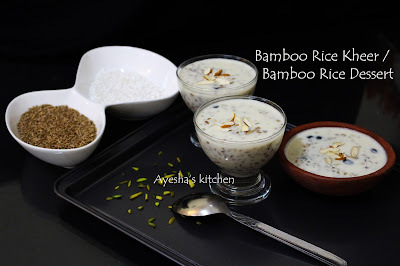 Bamboo rice kheer / Mulayari payasam / Moongil Arisi payasam is a delicious dessert made of bamboo seeds which is available in most of the organic stores or from gandhi gramam where most of the popular and fast moving products like honey, green tea, bamboo rice, brahmi powder, thaali powder, lemon grass oil are sold. 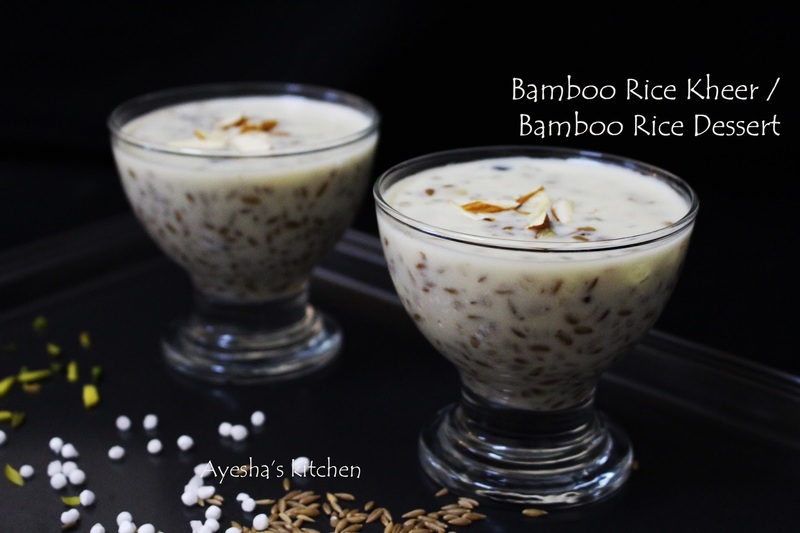 The payasam / dessert with this rice is very frangrant, delicious witha crunchy texture. 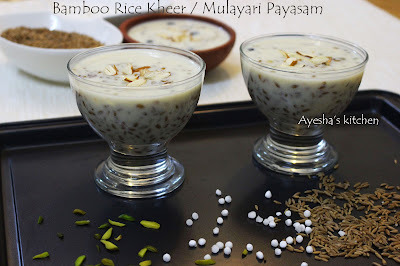 A must try healthy dessert or payasam recipe and is a great alternative rice dessert recipe for diabetic patients. Bambu rice / Mulayari is much rich in protein when compared to paddy rice and wheat. 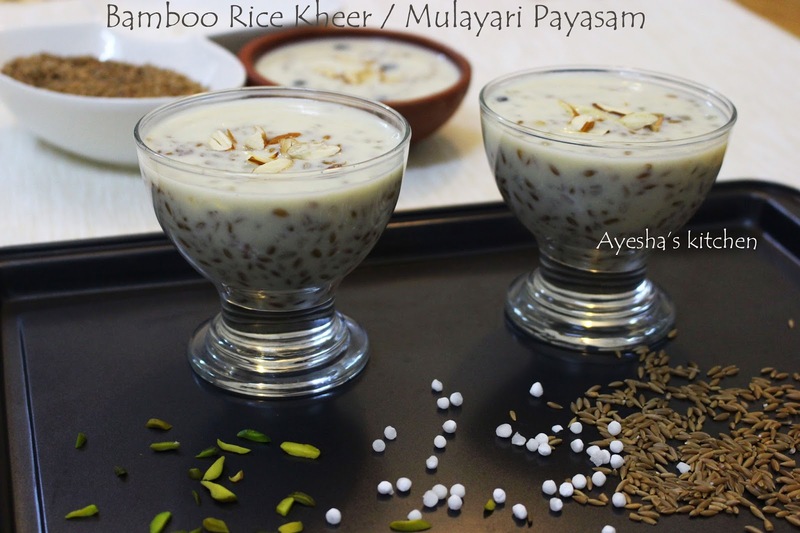 A wide range of delicacies like payasam/kheer , puttu / steam cake, uppumaavu are made of bamboo rice(mulayari) which are high on demand among tourists and foreigners. Bamboo rice has remarkable nutritious value. It helps to flush out toxins from the body. Bamboo rice collected from the seed of flowered bamboos has become the major source of income for tribal living in the wayanad, Kerala. They collect (the tribal woman and children) bamboo seed for earning their daily bread. The most interesting fact is that the bamboo groves flower once in a lifetime (about 40 years) and often die after flowering. Its a nature's hidden treasure. Bamboo rice is pungent, nutritious and strong. Bamboo rice can also be served as Asian style Risotto, or as a side when the cook wants a striking color to the meal. Then rice is actually moist and sticky when cooked well. But it will be brittle when cooked to that normal level which really makes the dish heavenly. Soak bamboo rice and sago seed in water in separate bowls for 2 hours. ( can soak more for easy cooking). Clean them properly and pressure cook them in 2 cups of thin coconut milk until 2 whistle. Now the bamboo rice will be 80 % done. Open the lid when the pressure releases and add a pinch of salt and milkmaid (condensed milk) to it. Combine very well. Let it cook on a medium flame for few minutes. If it is more thick, you can add some warm water. (If you are using jaggery, do not boil more after adding jaggery. So you must boil the bamboo rice more before adding the jaggery). When done, add dried ginger powder, cardamom powder and mix well . Finally add 1 cup of thick coconut milk to it .Let it cook for 5 minutes, mix well and remove from flame. The payasam/ kheer will be little crunchy but delicious. The crunchiness of this kheer makes it so special. So do not ever cook bamboo rice more until sticky. Oats has become a staple ingredient in most of the kitchens now. No matter which cuisine, it suits with all of those ingredients. I always look for some healthy breakfast recipes as i get bored of making the same sandwich, dosa, idly, steam cake, vellappam, pancake and all. More over oats has the reputation as a preferred healthy break fast ingredient. But how can one eat oats porridge all the day? ?...So here is the great option to include this great ingredient in your diet. Oats oothappam / uthappam will definitely makes your breakfast delectable. Normal uthappam is very similar to South Indian savory dosa (pancake) but will be more thicker than dosa. Here am sharing with you the recipe of Oats uthappam / oothappam which is the best recipe which i have tasted so far with oats. I had tried oats dosa, oats idly, oats upma, oats adai, oats porridge, cookies and of course i should say, this oats uthappam with mushroom masala is quite different from all with toothsome, mouthwatering, appetizing and what to say...something above all. All those Dosa / breakfast recipes i added in my blog were always a hit among my visitors and friends. 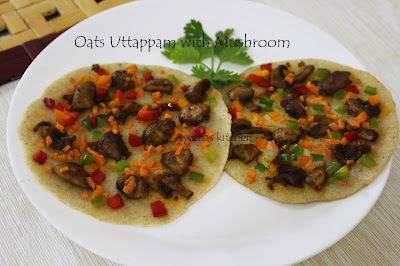 So try this Oats oothappam with mushroom too and am sure you guys will love this. So lets see how to make Oats uthappam with mushroom topping. Enjoy this delicious breakfast recipe with oats. The recipe courtesy.. Vahchef ..
Take the oats and powder it in the blender. Add it to a bowl along with semolina / suji and combine well with butter milk, salt and cumin seed. Make a thick dosa batter. As we mixed semolina, the water content we added will dries out quickly. So add water accordingly and the consistency must be thicker than normal dosa batter. It must not be a flowing consistency. It must be like idly batter consistency. Meanwhile prepare the mushroom roast. Marinate the chopped mushrooms ( 100 gm) with turmeric powder(half tsp), chili powder(1 tsp), coriander powder(1 tbsp) and salt. Heat oil in a wok and saute tomato(1 small) until mushy and then add the marinated mushroom to it. Cook until done . Do not add water. Heat a tawa / pan and brush with oil. Pour a laddle full of batter and spread it lightly. Immediately top it with chopped carrot, bell peppers and cooked mushroom. Drizzle some oil along the sides and top. Press slightly on the top with a wooden spoon or spatula. Cover it for 1 minute with a lid. Do not flip this uthappam. Cook on a medium low flame. 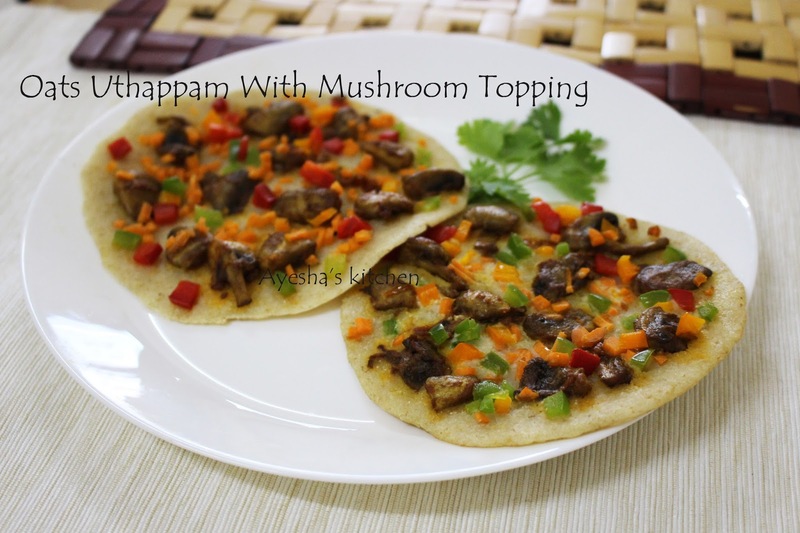 It will be crispy and soft uthappam with yummy mushroom flavor. Serve hot with chutney or with a nice cup of tea. Hi foodies ..here is the recipe for another lovely delicacy from Kerala. 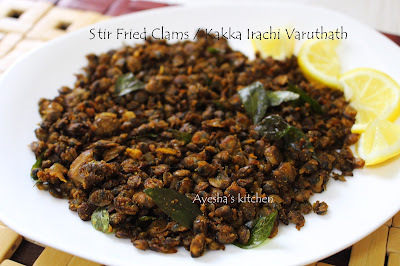 Stir fried Clams / Kakka Irachi Varuthathu / Clams pepper fry is Keralites all time favorite shellfish dish . Kerala style kakka irachi varuthath and mussels fry are an exotic dish that are just too scrumptious and finger licking good. I especially adore fresh clams and mussels marinated in freshly ground spices and then shallow fried with finely chopped tomatoes and shallots. The stuffed mussels is one of my favorite, which always brought me back to my mom making this stuff with fresh clams or mussels during my school days. More over this stuffed mussels / kallummakkaya nirachath is a very popular malabar dish and is much sought after item in every malabar adukkalas during ramadan. Remember....always try to get fresh mussels or clams, as eating dead ones will make you sick and bad. And it tastes best when it is stir fried in oil until it is golden and slightly crispy like prawns crispy fry. It is said that Clams are high in calcium and is good for kids. So try out this simple, rustic, crispy, delicious fry and what to say.... no words....Here is the recipe for how to prepare kerala style kakka irachi varuthathu / Clams fry / Clams ularthiyath / Mussels fry. Rinse the clams thoroughly in several changes of water to remove the dirt and can either boil it in some water for few minutes until the shells start gaping open or can steam the cleaned drained clams for 5 minutes until the shells get opened. Remember , do not over cook as they turn tough easily. Now drain the water from clams and remove the meat from shell, discard the shell and set aside the meat. Grind together all the spice ingredients in a blender to a fine paste with few tbsp of water (only if required). ( except oil and curry leaves ). The marinade must be little bit thick. Now marinate the cleaned clam meat with this mixture well and set aside for 30 minutes. Then heat a fry pan with some oil. For crispy frying, we require more oil. 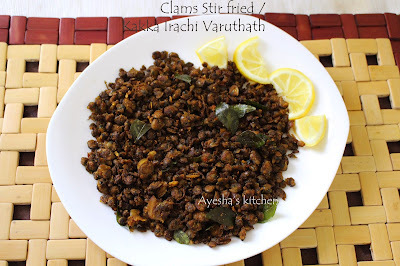 Fry the marinated clam meat along with curry leaves until crispy, over a medium flame. You must stir in each 2 minute intervals. It will take around 5 - 10 minutes for a tasty perfect clam meat fry. Enjoy with steamed rice or dosa or roti !!!!! Smoothie / smoothee is a thick beverage made from blended raw fruits or vegetables along with any kind of ice cream or any diary products or some sweeteners. Here am presenting to you the most preferred smoothie in UAE...Its Burj al Arab smoothie / Burj al Arab juice...There are many kinds of smoothies available around the world which are very popular worldwide. Green smoothies are known to be the healthiest smoothies than the others. 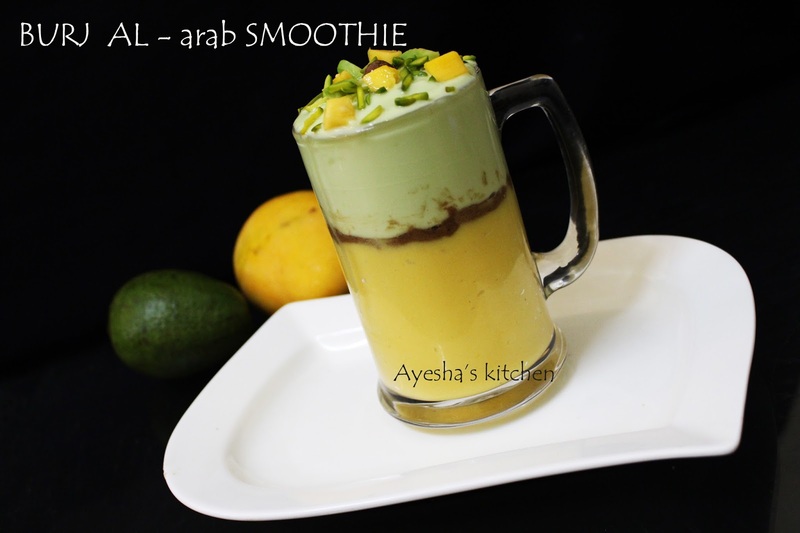 Burj al arab smoothie is named after the world famous building in UAE.. Burj al arab is the combination of avocado and mango smoothies with a strawberry sauce flavor ..It attracts people of all ages from kids to adults due to its vibrant color and yummy taste. This lip smacking smoothie is just enough to make your tummy yummy!!! Just stir the smoothie a little before your first sip....aww..its really an inviting smoothie..Enjoyy!!!!! Blend half of a mango, 1 tbsp of sugar, 2 tbsp of vanilla ice cream , 1 tbsp of milk and strawberry sauce to a fine smoothie. Pour it in the serving glass upto half of the glass. Chill until avocado smoothie gets ready. Blend half of a avocado, 1 tbsp of sugar, 2 tbsp of vanilla ice cream, 1 tbsp of milk to a fine smoothie. Chill till serving. Take the prepared chilled mango strawberry smoothie from fridge, line in between with chocolate sauce gently and pour the avocado smoothie slowly with a ladle . Top it with fruit chunks and pistachios. Stir a little while drinking for a luscious drink.. Here is an easy and yummy dinner meal to rock your taste buds. 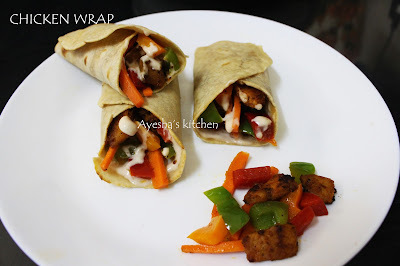 Making chicken wraps or vegetable wrap for dinner or breakfast is a great idea whenever we are busy and tired. We will have most of the ingredients on hand and will be ready to use. 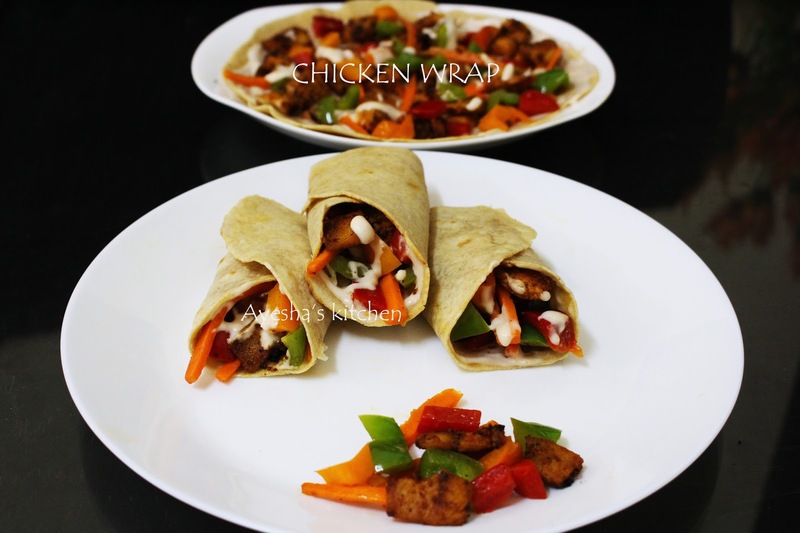 You can also made this chicken wrap sandwiches with leftover chicken or mutton or fish. 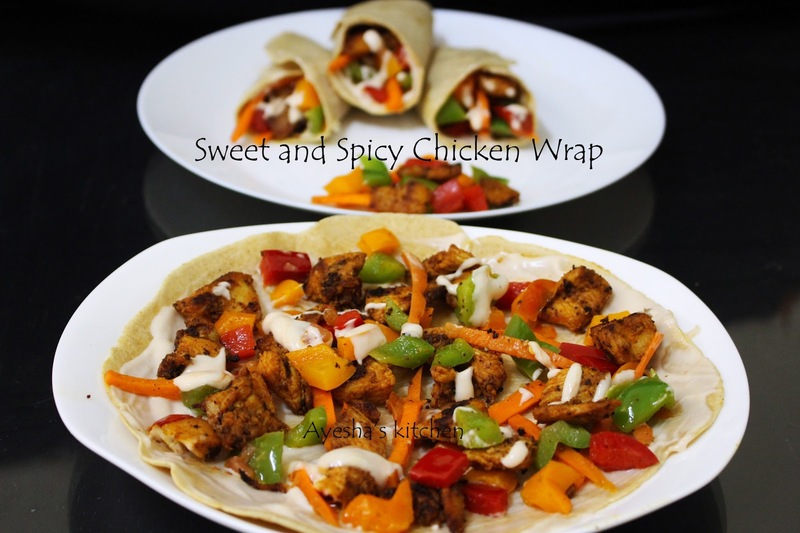 Chicken breast work best for this special wrap recipe. Its too simple when you have left over fried chicken and some bell peppers along with veggies will do the rest. Here finely cubed chicken is marinated with tomato sauce, soy sauce, along with spices and then shallow fried in butter which gives the real flavor. The finely chopped bell peppers and thinly sliced carrot are tossed in butter along with pepper powder and salt for one minute and mixed up with the fried chicken. And finally assembled in wheat roti or chappathi with a layer of mayo and tomato sauce (or sweet and sour sauce ) and then add those tossed fillings and you have a delicious healthy meal that is ready to go. So lets see how to make an easy dinner meal / how to make chicken wraps within minutes at home. You can add cabbage and veggies of your choice too..
Marinate the thinly cubed chicken breasts pieces with the above ingredients given under marination and toss in butter until it turns golden in a medium flame. Set aside. Now toss the carrot slices and chopped bell peppers in butter along with pepper powder and salt for a minute or 2 minutes. When done set aside. Combine together mayo and tomato sauce well in a bowl. Now take a chappathi, spread 1 tbsp of mayo mixture and line it with tossed veggies and fried chicken. Spread a layer of mayo mixture again for a creamy chicken wraps. Wrap it slowly and tightly. Serve and enjoy your dinner with a cocktail or any fruit juices. Its very simple to bake cheesecakes than normal cakes. I was in a bit worry regarding the un molding of this cupcakes. But it turned out really well . No more worries and i really enjoyed those lovely cheesy muffins with bits of mango puree topping. Really sinful to eat chilled cheesecake . The important thing to be noted is, we should have to wait for hours for chilling the cupcakes after the baking process. Some of my friends keep the baked cheese cake in freezer until frozen and set out 15 minutes before serving. 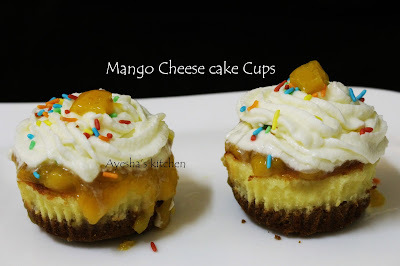 Hope you all will enjoy this mango cheese cake cupcakes and here is the recipe showing how to make mango cheese cake muffins / cupcakes. Powder the digestive biscuits and combine it with melted butter. Mix well with your fingers. 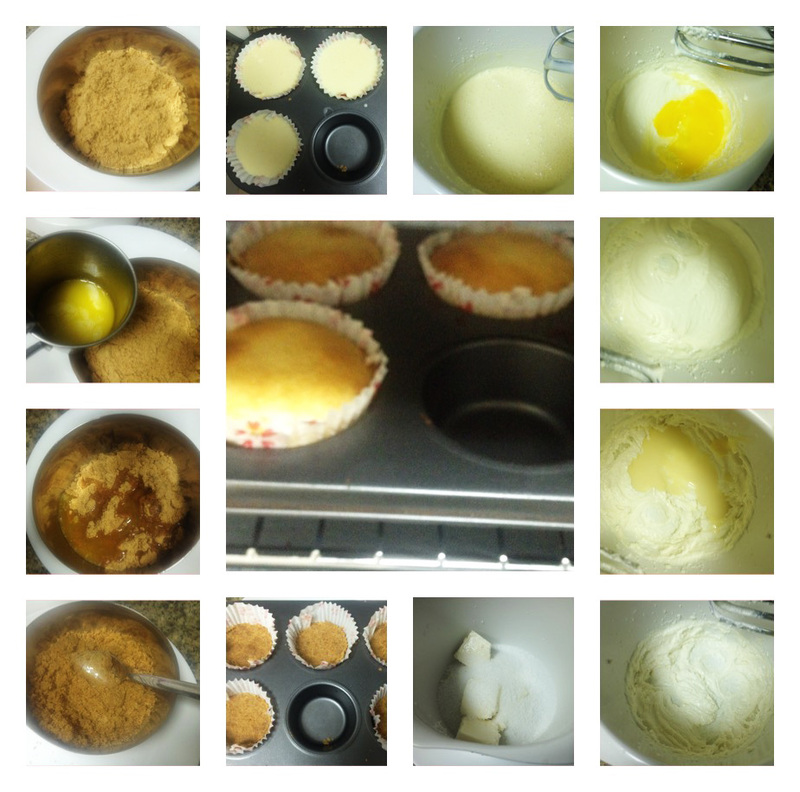 Press the crumb mixture in the paper cupcakes with your finger tips or back of a spoon. Keep it in refrigerator until the base sets, for about 30 minutes. Now for the filling, beat together cream cheese, sugar until smooth. Add sour cream and pulse again until smooth. Then add condensed milk again beat until smooth. Now add eggs one by one along with lemon juice, vanilla essence and beat well. Do not over process the mixture, just want it to be smooth. Now scoop this filling over the biscuit crust . 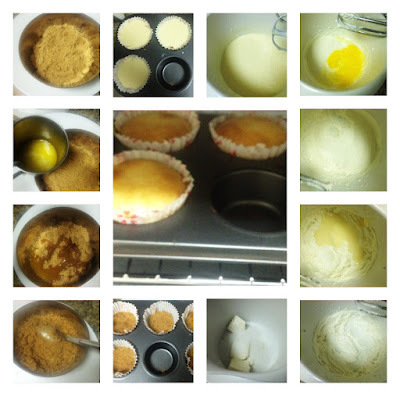 Bake it in a preheated oven (180 degree C) for 20 - 25 minutes or until the center of the cupcakes are firm. Let it cool in tray on rack for 10 minutes and then refrigerate for 2 hours or overnight. BE CAREFUL.. Do not remove the paper cups immediately . Let it stay cool for few hours and then do the whipping. Meanwhile add chopped mangoes, sugar, lemon juice in a heavy bottomed sauce pan and bring to boil. Let the mangoes cooked well and become mushy. Then add the cornflour mixed in water and simmer for few minutes , stirring continuously. Let it cool. After 2 hours or when the cheese cake is well sets, remove the paper cups slowly and top it with 1 tsp of cooked mango pulp sauce . And frost it with whipping cream.